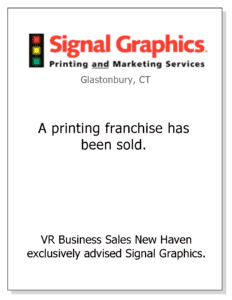 VR Business Sales performed exceptionally in helping us sell our business. 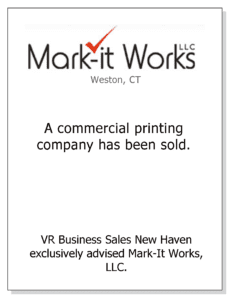 The valuation was spot on, the marketing presentation was complete and professionally done, and the marketing program secured an out of state strategic buyer for us within one month of listing the business and we sold it three months later. Jeff Swiggett thoroughly handled many of the transaction details and advised us throughout as to what our options were. We wouldn’t have concluded the transaction as successfully without his services. 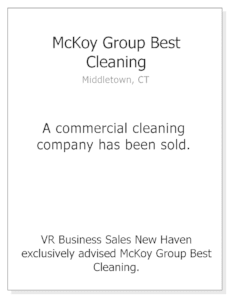 I’d recommend VR to any business owner. 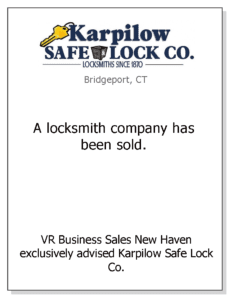 The sale of our business was fairly complex mainly because of the demands of the bank that funded the acquisition for the buyer through an SBA guaranteed loan that involved many levels of security all of which had to be negotiated with the buyer. Al Guthrie of VR was instrumental in making sure this process was handled smoothly. Also, Al’s background as a former business owner enabled him to give advice as to how we should present our financial statements to show the true value of the firm which in the end yielded a selling price that we were very satisfied with. We were very happy with the entire experience with VR. 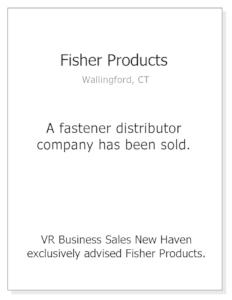 We were very pleased with VR’s assistance in the sale of our industrial fastener distributorship. 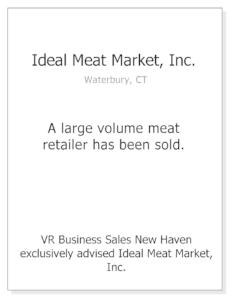 VR’s valuation of the business was close to the sale price and they were able to secure a buyer in a short period of time in a very difficult economic climate through their effective and intensive marketing efforts. The profile they compiled for marketing the business re-cast our financial information to show the true cash flow and value of the business and gave a concise, well defined description of the opportunity. If we had to do it again, I wouldn’t hesitate to select VR to represent us. 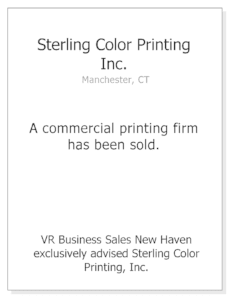 VR Business Sales moved my business in short order and handled both the buying and selling side in a professional manner. 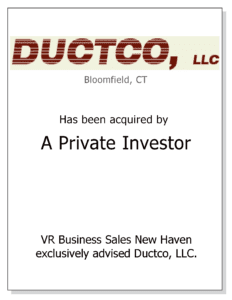 My business was somewhat unique, yet VR was able to secure numerous inquiries and ultimately locate a buyer who was seeking exactly the business I was selling. 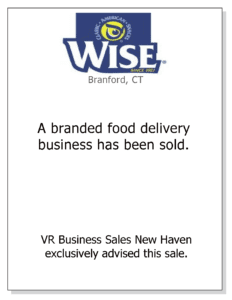 The presentation was professional, the follow up was always timely, the advice and direction, were all factors that were instrumental in the successful sale of my business. 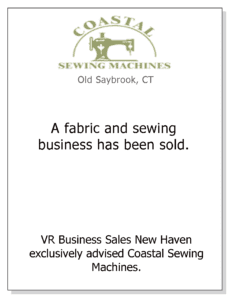 Anyone considering a business broker need look no further than VR Business Sales. 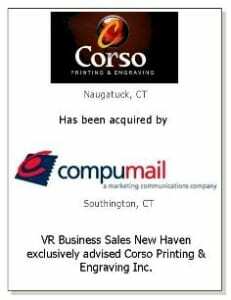 VR Business Sales New Haven provided invaluable assistance in the valuation, marketing, sales price negotiation, and selling transaction for my employment agency. 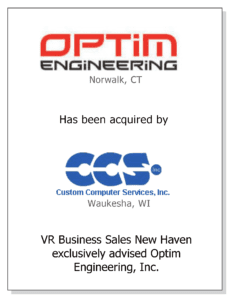 VR’s Bill Hall took the time to understand thoroughly the peculiarities of placing engineers and skilled technicians at our clients’ manufacturing plants as temporary employees. 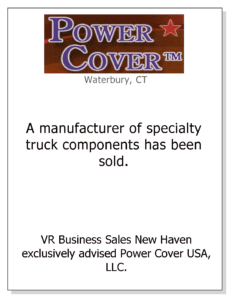 His steadfast efforts as an intermediary between us and potential buyers resulted in the sale of my business to a national temporary technical services company, at the full asking price. 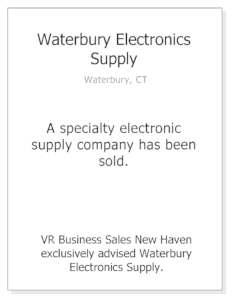 I enjoyed getting to know the folks at VR Business Sales in New Haven, and recommend them to any business owner who wants to market and sell his business in a professional, ethical, and timely manner, at a fair price. 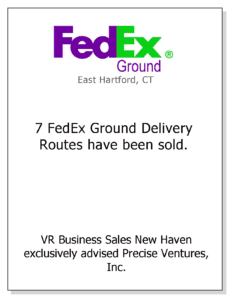 VR Business Sales of New Haven recently represented me in the sale of my business which consisted of nine routes and ten trucks for FedEx Ground. 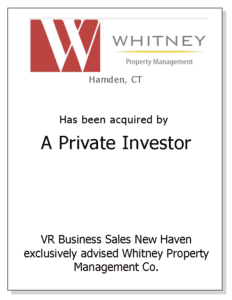 VR brought several qualified potential buyers to the table and we ended up with two competing buyers which resulted in a sale higher than our asking price! During the due diligence process, which was complicated by the fact that FedEx was changing its business model in mid-stream, VR made sure that information flowed smoothly and as needed. 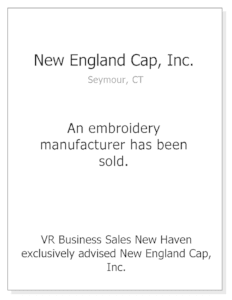 VR went out of their way to accommodate the needs of our out-of-state buyer, as well as my limited time constraints as an owner. 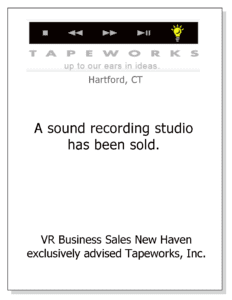 I highly recommend VR Business Sales of New Haven to anyone who wants to sell a business. Their representation is reliable, ethical and thoroughly professional. When we decided to sell our property management firm, we wanted to work with a group that understood the nuances of our business, the value that we believed it had and would be able to draw sufficient number of buyers so that we could find the right one that would pay a fair price and take care of our clients and our employees who had worked with us for so long. 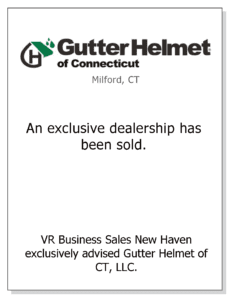 In our view, VR and their representative, Al Guthrie, was able to accomplish all of this. Their valuation was spot on. 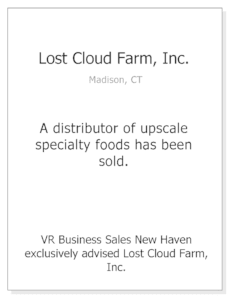 They brought us numerous buyers and helped us navigate our way through the transaction process, which for a business like ours can be quite complicated. 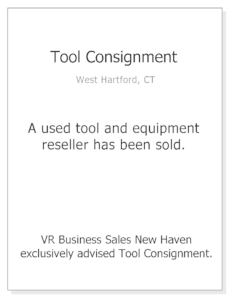 We wouldn’t hesitate to recommend VR to any owner wishing to sell their business. 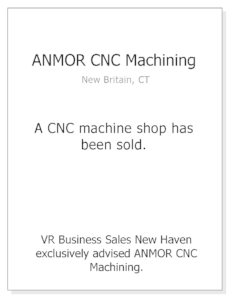 As a second tier supplier to the aerospace business, I knew that I wanted a trustworthy and knowledgeable business broker to value my business and find a qualified buyer while presenting my CNC machining business to them in an efficient, professional manner. 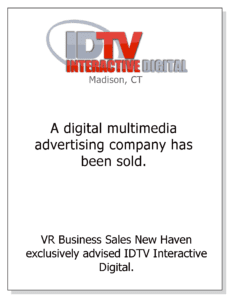 VR Business Sales acted as my intermediary with a large number of local, regional, national and even international prospective buyers that responded to VR’s marketing. 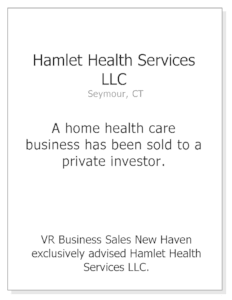 I was professionally represented on many tours of my facility, and VR responded to all buyers’ requests for information and data in a timely, thorough manner. 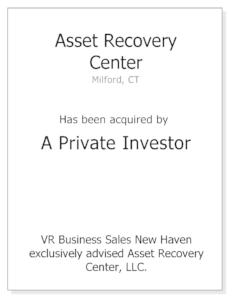 When an acceptable offer resulted, VR made sure that the sale was negotiated well on my behalf, and coordinated the many due diligence requirements so that we were able to proceed to closing in an expeditious manner. 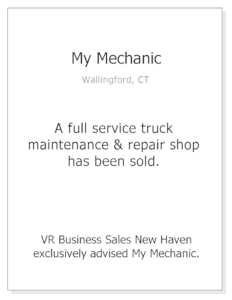 I recommend VR Business Sales of New Haven to anyone wishing to sell a business! 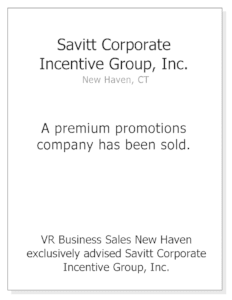 When we asked VR to sell our premium promotions business, we told them that we wanted to do it quickly. 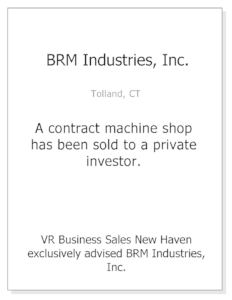 After valuing the business and explaining the terms under which we could expect it to be sold, they prepared the business review and immediately began confidentially marketing it to their internal buyer database. Within weeks, we had several interested parties and quickly narrowed it down to one buyer. The deal was closed shortly thereafter. 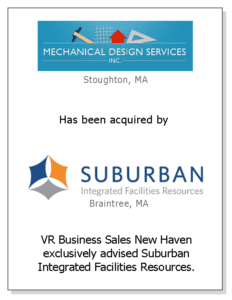 VR helped us through the entire process and was key to making the transaction happen. 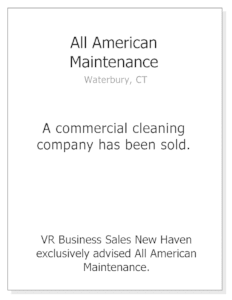 We’d recommend their services to any owner.